Photo Tip #3. If you miss the best light, let the sun shine thru! Many photographers say the best light is at sunrise or sunset and I won't argue with that. The light can be amazing early and late. Still, may I suggest, there is always a good light if you can just find it. I know in the middle of a bright day the reflection off leaves or metal can be intense blotting out the color and leaving only brilliant light blinding shine. But, if you look thru your eyes that same time of day that is what you see. This is the time of day to watch for a passing cloud, find a shade tree or just use a piece of cardboard to make your own shade. Here I chose to just use the bright sunlight as a back light. Of course if it work for you, you can use an artificial light to make your own "best light"! 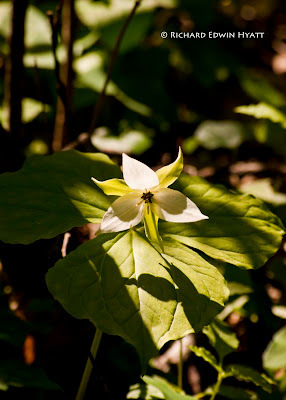 This White Erect Trillium was captured on the Cove Hardwoods Trail in the Great Smoky Mountains National Park near the the Chimneys Picnic Area.